Last Saturday 44 students and 5 chaperones went to New York City for the annual Drama Club Broadway trip. They saw two shows, Frozen and The Prom. The Club also got a backstage tour of the New Amsterdam theatre, the original home of the Ziegfeld Follies and the current home of the Disney musical Aladdin. 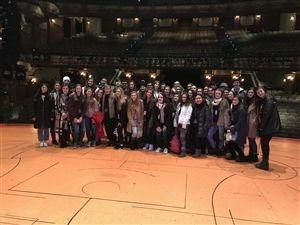 During the tour, the students took a group picture on stage and got to try on actual Broadway costumes and props from the shows that have been produced on the New Amsterdam stage (Mary Poppins, The Lion King, Aida, etc.) It was a fun day over all!